My email just received this mail. They clamed 150 XML by create new account. After that, you must connect to facebook. How do we get more invition mail same this? We shared the happy. But I don't understand how to send it to our email? 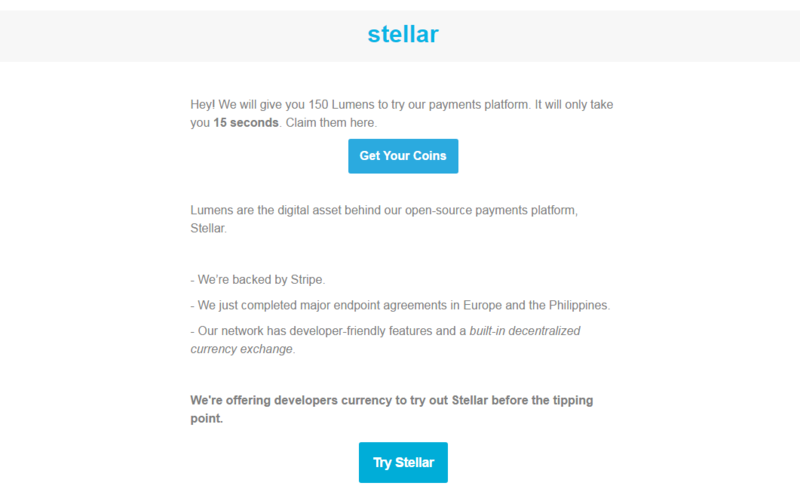 I am a newcomer, how do I sign up a new account stellar? any thread to help newbie like meh? I am also waiting for invitation to get free 150 XLM. But I think distribution via invitation is temporary not active. Have anyone know any other method to get free XLM. I dont get this email too. Ugh. Waiting. I want to recueve 150 lumens too. sadly, i didn't get this email. how to get this free lumen from email invitation ? I do not receive a mail from stellar, how can you receive the mail? Hello i'm newbie, and i'm not receive invite stellar. Hmmm...how they get your email? Feel free to send me some stellar..